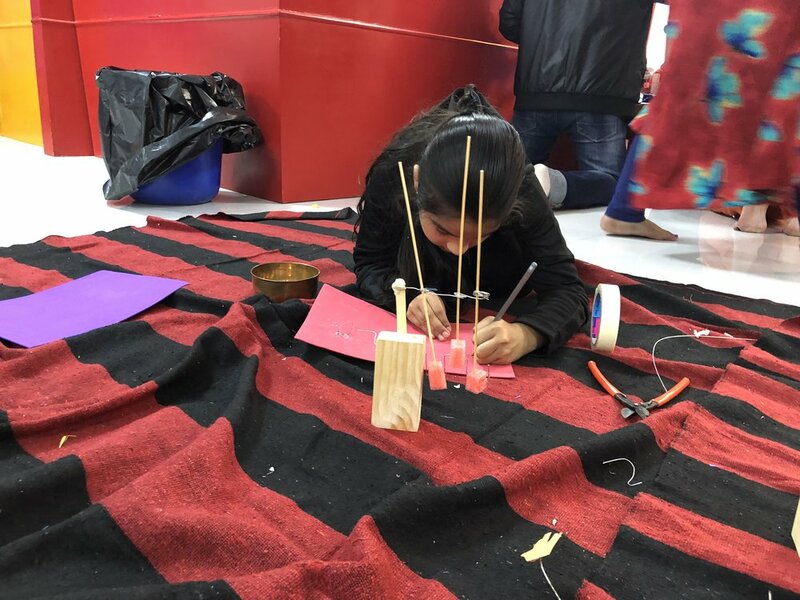 Khoj Club Workshops for Youth in Udaipur — Wonderful Idea Co.
After the two day professional development workshop with staff and volunteers at the Dharohar office in Udaipur, India, we moved to a pop-up space in celebration mall for a series of afternoon tinkering workshops for local kids. After the PD workshop, we moved over all the various materials from the office space, built some new materials storage bins and reconfigured the mall space. We set up a space for the hands-on activities as well as a circle of cushions for reflection and initial discussion. The idea of the three-day series of workshop was to try to put into practice the ideas that we experimented with and discussed during the previous workshop. For each of the youth workshop sessions we had three facilitators from the workshop. 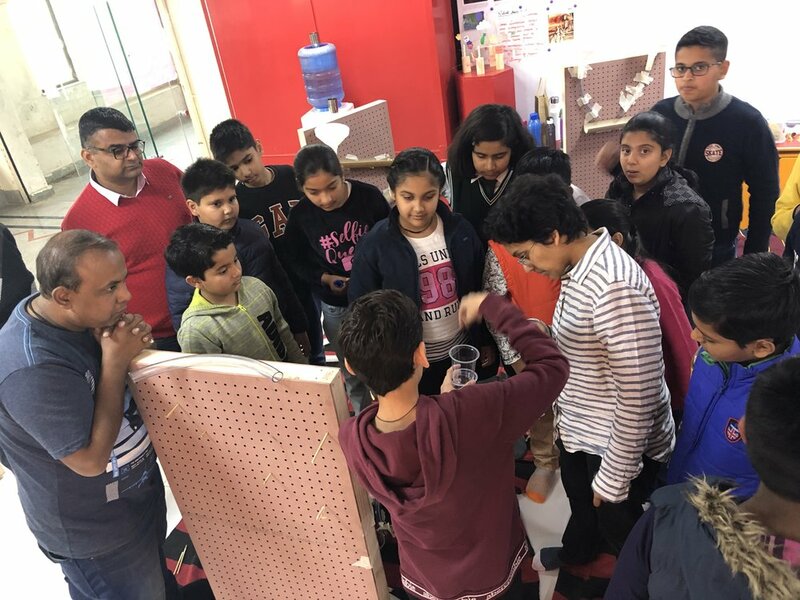 For the first marble machine workshop we had Ashish, Nitesh and Irfan working with the group. As a way to get the tinkering started right away, we set up a little exploration station with DAGU motor circuit boards with platforms, white paper and colored markers for the participants to create little spinning art work. As the kids came into the room they started playing and experimenting right away and we taped all of the creations onto the back wall. At the start of the workshop we formed a circle and played a little game to learn each others names, but quickly moved to introducing the marble machines activity. The kids split up into pairs, collected materials and started building their machines. It was great to see how the group started collaborating and working together. We noticed lots of unexpected ideas that popped up around the room which included a track filled with sand, a game with multiple exit points and some really risky jumps. As a way to reflect on the tinkering process, we went around the room and admired each machine as well as had each person write or draw their machine. We were really impressed with the ways that the kids created a detailed descriptions of their machines. At the end of the session, we met with the group of faciliators and quickly reflected on the experience of running the workshop. We took inspiration from the Family Creative Learning Guide by Ricarose Roque and shared the “red, yellow and green” moments from the session. The next day we moved to cranky contraptions. We were a little nervous about how difficult the activity might be and though that three hours of these wire automata might be too much for the group. So we decided to try out a linkage exploration with some scraps of blue plastic that we found at the Secure Meters junkyard. These intial linkage explorations inspired by Noga El-Hassid moving toys workshop were less open ended but gave the group a chance to start building and thinking about mechanisms together. After about forty five minutes the students spontaneously hung up their creations on the wall near our spiral art. Another real world treasure from the scrapyard was a broken gas meter that we remixed into a funny character. It was so cool to see how linkages are used for a real purpose in a common appliance. It would be a nice extension to allow kids/adults to dissect and remix these meters into playful creations. For the second half of the workshop we investigated the motions and mechanisms through building personalized cranky contraptions. 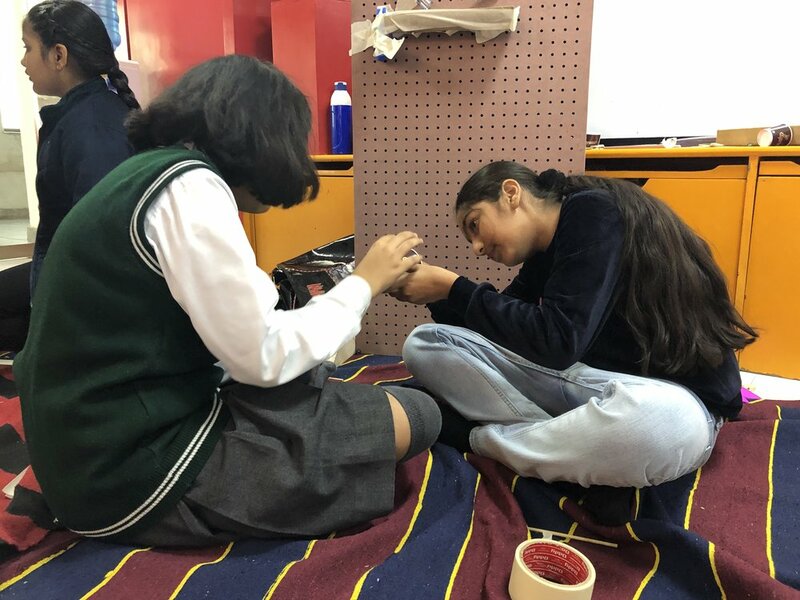 The kids focused intensely on their projects, took tool use seriously and collaborated with each other and facilitators to turn ideas into reality. With this activity we always notice an amazing variety of projects which demonstrates the “wide walls” of the exploration. I loved the sense of humor that they brought to their machines that included a meowing cat, a flying superhero and and chopped up fish. At the end of the day we reflected on the workshop and then set up the room with all the materials for the chain reaction and built an example table for the next day. We met on Sunday for the last day of the three day workshop and introduced the idea of a chain reaction machine. The participants got into pairs and groups of three to build their Rube Goldberg inspired contributions with balls/tracks, dominoes, pulleys and pendulums. Before starting work we demonstrated how to make a aluminum foil switch to trigger a motor which each group ended up integrating into their contraption. We felt like this activity showed our crew of Harshe, Sanhita and Aarti most fun and challenging side of facilitation as they worked to figure out what help the participants needed and to think about how to best support their ideas. Teamwork was a bit of a challenge with some of the groups so we also spent time as facilitators working to support conversation and collaboration. This meant that at times we took a more active role in the groups to direct some of the work. We invited parents into the workshop for the last twenty minutes to show off the creations that the kids made over the course of the three hours. They were really impressed by the complexity of the machines as well as the excitement with which the kids described their machines. The machine went off with liberal use of the magic finger and everyone cheered for the hard work that the kids put into the three days of tinkering. 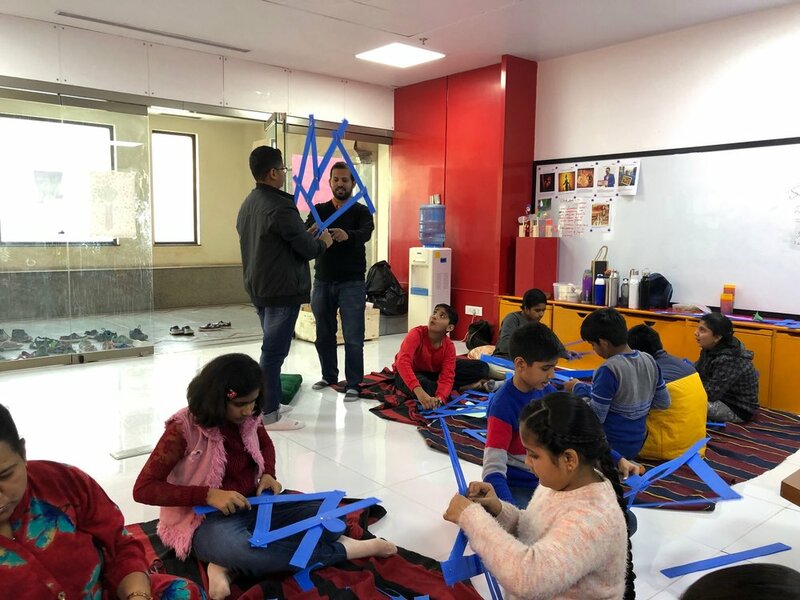 The three days were just an initial spark, but we could tell that the kids and parents identified many qualities of the activities that we value like collaboration, problem posing/solving and development of understanding. And it was a great chance to work hand-in-hand with the education staff after the PD workshop. I hope to try to incorporate these types of activities after future workshops as we continue to travel around the world learning from kids and adults about the ways that tinkering can grow and change in different contexts.